Black Sun Ensemble - "s/t"
The first-ever reissue of Black Sun Ensemble's true debut LP (a second, also self-titled, album containing later recordings of some of the same tracks was the first BSE release on Reckless records in 1988) from 1985, an extremely hard-to-find collectors' item that many people were unaware of up until now. Which is unfortunate, as this is unquestionably the band's masterpiece, glimpsed and grasped at, but never quite reached on their subsequent releases from the late 80's to the present. 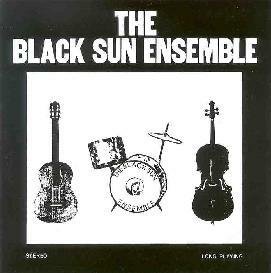 Founded and led by guitarist Jesus Acedo (joined here by the same bassist and drummer who, with others, play on the Reckless debut), Black Sun Ensemble originated from Tuscon, Arizona, and truly captured the sounds of spacious deserts on this album. Acedo's guitar strums are languid and flowing, hypnotizing in their subtly-shifting near-repetitions... his soaring modal leads bristle with intense barely-under-control fuzz, warped with apocalyptic string bending... at one moment they might invoke great expanses of warm comfort, at others, bleak landscapes of cold doom and torturous shocks. While some songs are noted as improvisation, most have a free-playing sound to them, even the structured compositions; melodies range from ringing drones to sweet lullabies, such as the wistful violin on "Ice Breaker". Many of the albums finest moments consist of chiming electric/acoustic guitar improvisations over a slowly pulsating rhythm section, moving at the pace of cough-syrup induced hallucinations. Some of it does come off a bit disjointed, and despite the awesome individual feel of Acedo's guitar playing, his riffs won't impress the technique freak (especially on this early recording). But the sensitivity and power demonstrated in many areas of this recording more than overcome any unevenness. Definitely a re-issue that falls under the category of "invaluable public service" (and one for fans of Calexico / Desert Sessions take note of).